Chopped BBQ tofu salad is topped with saucy bites of baked bbq tofu, black beans, corn, tomatoes, red onion and ranch dressing. So simple and So delicious. After making my crispy baked tofu bites, I wanted to find some fun and flavorful ways to flavor the tofu and so into a bowl of bbq sauce they went. 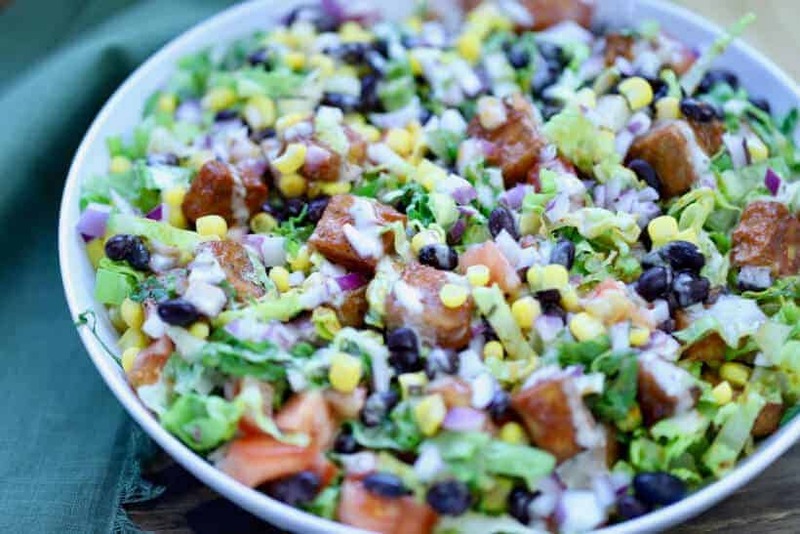 Because the BBQ tofu bites reminded me of BBQ chicken, I immediately knew I wanted to use them on a salad, and that my friends, is how this BBQ tofu salad was born. Start by preparing my crispy baked tofu. Toss the tofu in your favorite BBQ sauce (or make it from scratch). Chop crispy romaine and place in a nice big bowl. 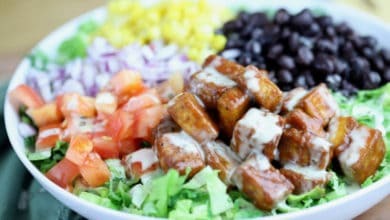 Top with chopped tomatoes, red onion, black beans, corn and BBQ tofu bites. Drizzle with your favorite ranch dressing (this is mine) and enjoy! Did You Make This BBB Tofu Salad? This hearty salad is easy to make and seriously delicious. Feel free to trade in bbq chicken in place of the tofu. Prepare crispy baked tofu according to this recipe. Add bbq sauce to a medium sized bowl and toss the tofu in the sauce to coat. 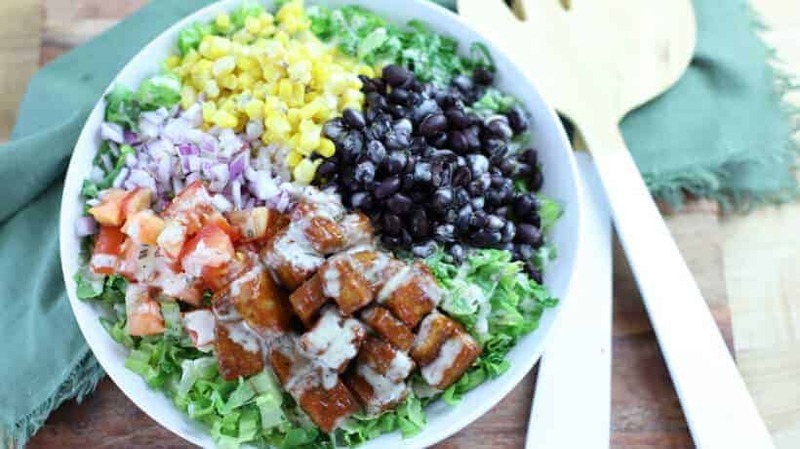 Place romaine in a large serving bowl and top with tomatoes, corn, black beans, red onion, and tofu. Drizzle with ranch dressing** and enjoy! *If you do not need to keep this recipe vegetarian or vegan, you can also swap out some chicken for the tofu (rotisserie chicken can be a great time saver). **I don't have a recipe for homemade ranch (yet!) but this is the one I use and recommend.